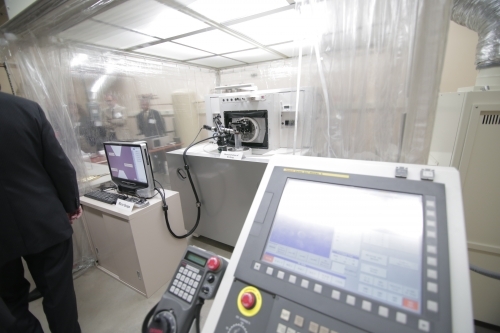 The University of Wisconsin–Madison College of Engineering is the new home of a unique machine capable of milling in three dimensions with nanometer precision. The machine, called the ROBONANO α-0iB, is the first of its kind in North America, and offers the sort of advanced technological capabilities that represent the future of advanced manufacturing. The ROBONANO is on a multiyear loan from the Japanese robotics manufacturer FANUC to the laboratory of Sangkee Min, a UW–Madison professor in the Department of Mechanical Engineering and the Grainger Institute for Engineering. The ROBONANO’s capabilities offer Min and colleagues new research opportunities, which he hopes will lead to improved approaches to the manufacturing of everything from semiconductors to toys and mobile devices to scientific instruments. The 5-axis machine has nearly limitless configurations for cutting, scribing and milling materials, but ROBONANO’s superiority over previous generations of similar machines is obvious: Its ability to cut at the nanoscale is two orders of magnitude more precise than most machines used in advanced manufacturing today. “Many materials have different properties at the nanoscale that create all sorts of different possibilities that aren’t possible with conventional machines,” says Min. He will explore ROBONANO’s suitability for manufacturing emerging materials — as well as available materials like synthetic sapphire, a promising shatter-proof alternative to glass for screens on devices such as tablets and smartphones. Made from heating aluminum oxide to extremely high temperatures, synthetic sapphire is difficult to manufacture at large scales because it is very brittle and difficult to handle. However, Min’s initial research on synthetic sapphire with the ROBONANO in Japan showed that the material can be far more pliable when handled at the nano level. Min also hopes to explore how machining on the nano scale can open new possibilities for manufacturing design. Most designers are constrained by manufacturing limitations that can choke creativity and slow innovation. Min points to smartphone design as a prime example of this “design for manufacturing” paradigm leading to stale product lines. That’s because manufacturers have long-term investments in supply chains that are difficult and costly to change. Min’s research with the ROBONANO will identify ways to speed up the process and flip the manufacturing paradigm — manufacturing for design. 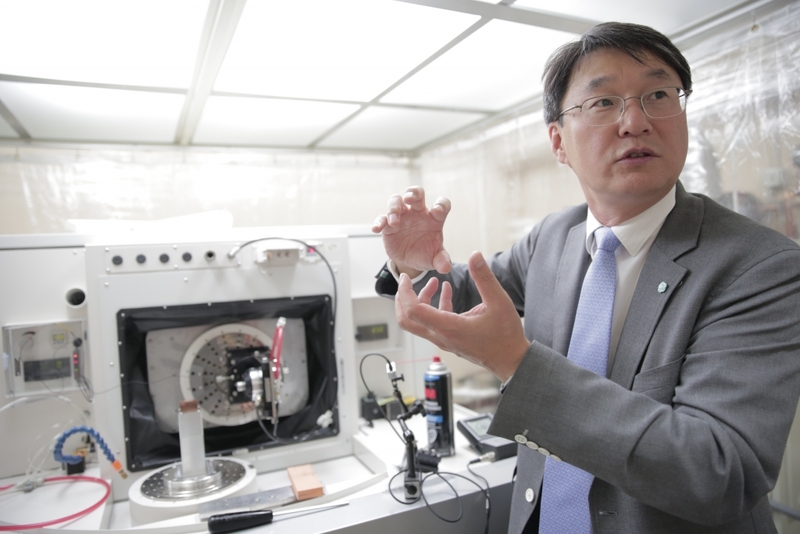 “I want to be able to ask the manufacturer, ‘what is your perfect design?’ and be able to provide that,” says Min, who has already helped a national laboratory vastly improve the imaging capabilities of a microscopic instrument it manufactures. 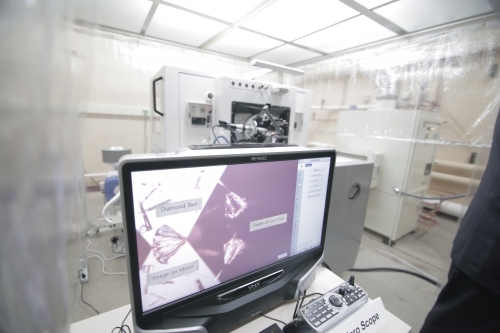 The ROBONANO has been used for 10 years in Japan by the semiconductor industry — one industry among many Min believes can benefit from the instrument’s capabilities. He has been approached by the toymaker Lego and other well-known brands to discuss new fabrication approaches. “The opportunities are almost limitless for improving products and manufacturing processes with this machine,” Min says.